All Master’s and Ph.D. level students are invited to attend this outstanding career fair that is sponsored by six universities. This career fair will feature employers interested in hiring the best, most qualified candidates for their companies. This event typically draws over 500 advanced degree candidates and is a great opportunity to learn about internships, postdoctoral, and full-time positions. At present there are 45 organizations who have registered to attend: AARP, Air Force Health Professions, Applied Research Associates, Inc. (ARA), Arthrex, BAE Systems, Inc., BD (Becton, Dickinson & Company), Beijing Royal School, Carney, Sandoe & Associates, Charles Aris Inc., ConsenSys, Danfoss, Federal Bureau of Investigation, Georgia Tech Research Institute, IMPACT Pharmaceutical Services, Indeed, Innovative Decisions Inc., m3 Engineering & Technology, North Carolina Department of Health and Human Services, Nuventra Pharma Sciences, Oak Ridge Institute for Science and Education, Oak Ridge National Laboratory, ORISE Department of Defense Programs, Peace Corps, Pendo, PETA International Science Consortium, Precision Lender, Procter & Gamble (P&G), Reata Pharmaceuticals, Research Square, Reynolds American Inc., RKF Engineering, RTI International, Sandia National Laboratories, SAS, Solutions Through Innovative Technologies Inc., Southern Teachers Agency, Stallergenes Greer, State Street Corporation, TE Connectivity, The Henry M. Jackson Foundation for the Advancement of Military Medicine Inc. (HJF), The Home Depot, U.S. Air Force, United States Army Special Operations Command, US Food and Drug Administration (FDA), and Wells Fargo. A few will host mini-information sessions: Wells Fargo, Research Square, ORISE Department of Defense Programs, Sandia National Laboratories, Danfoss, BD (Becton, Dickinson & Company), and State Street Corporation. The event will be held at The Friday Center in Chapel Hill, NC. Event directions and parking information: https://fridayconferencecenter.com/about/. Make your short list to visit while at the fair. Develop at least two well thought out questions to ask each representative. Be open to speaking with other companies you didn’t plan for. Attend info sessions to gain additional knowledge. Take care of yourself! Get good rest the night before and eat breakfast. Bring several copies of your *reviewed resume, paper, and a pen for notes. Draft a thank you template email to be adapted later for each representative you meet. Students who are interested should register for the event. If you are interested in carpooling to the event, please fill out this form. *If you haven’t had your resume reviewed, email Linda Whited at whitedlm@nullwfu.edu or plan to stop in Reynolda Village Graduate school office 118A on November 6 11am-2pm for a resume review. 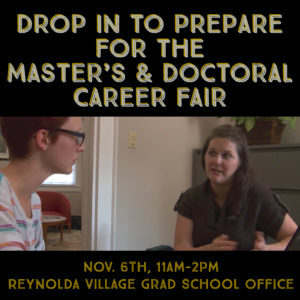 Need directions to the Graduate School office in Reynolda Village? Parking is available down the hill from Silo Bistro or behind Boho Blue (a retail store). You can also access the office from the walking path from campus. Can’t make it? Schedule an individual coaching session with Linda to prepare. 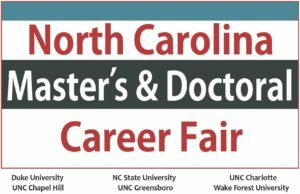 For more information, please see the NC Master’s and Doctoral Fair website.